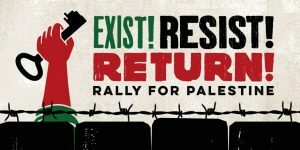 Rally for Palestine: Exist! Resist! Return! Since the election of Donald Trump the collective rights of the Palestinian people have come under intensifying attacks. Israel has further entrenched its system of oppression; passing a racist nation state law, maintaining its crippling siege on Gaza, and continuing to rapidly expand illegal settlements in defiance of international law. Israel also killed more than 200 unarmed demonstrators during the ongoing Great Return March, and injured more Palestinians in 2018 than during the entire war on Gaza in 2014. Meanwhile, Trump’s cuts to UNRWA funding are part of a wider attempt to redefine the refugee status of millions of displaced Palestinians and erase their fundamental Right of Return. So the Palestinian people need our solidarity more than ever, and are calling for global protests to protect their rights. As Israel continues to flout international law and violate human rights, there is a responsibility on the global community to hold it to account and push for an end to the oppression of the Palestinian people. March 30th is Palestinian Land Day – when Palestinians across the world remember the unarmed protesters killed by Israel in 1976 during demonstrations about Israel’s theft of Palestinian land. This year, March 30th also marks the the 1st anniversary of the start of the Great Return March. These ongoing protests, taking place every single Friday, have seen thousands of Palestinians fighting for their right of return to their villages and homes from which they were forcibly removed. Many have been irreversibly injured and even killed for doing so. The Palestinian people refuse to give up their struggle for justice. It is our task to draw inspiration from their endurance and answer their call for international solidarity. 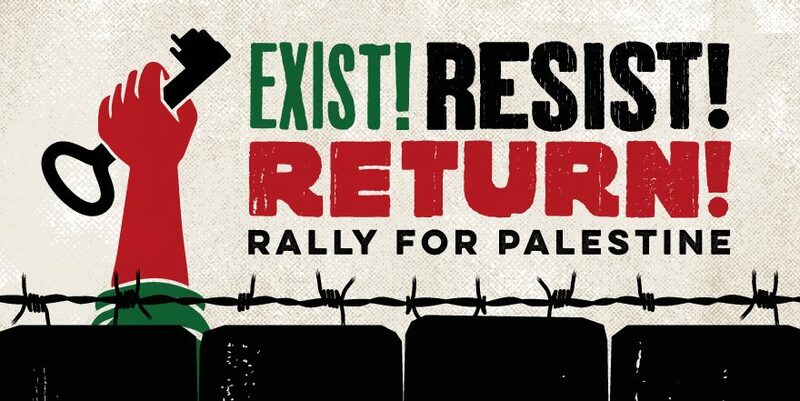 So join us on March 30th to show support for the Palestinian struggle, and to rally for Palestinians’ fundamental rights to EXIST, RESIST & RETURN!